This scarce and large hand colored map depicts the town of Riverhead, Long Island, New York. 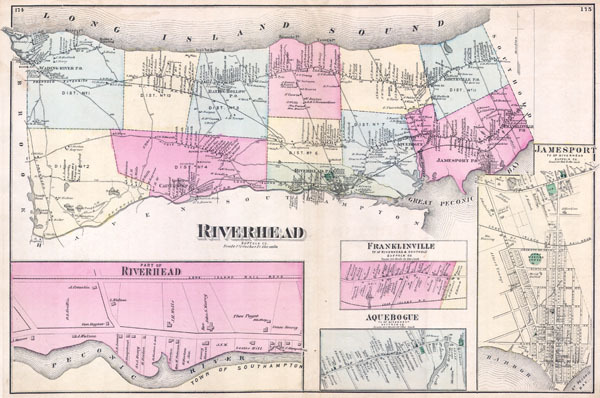 Map depicts the populous cities and towns surrounding Riverhead, including Franklinville, Aquebogue, Jamesport, Wading River, Baiting Hollow, Northville and Calverton. Includes detailed insets of Franklinville, Jamesport, and Aquebogue. Southampton lies to the south. The extraordinary detail of this map, down to individual households with family names, make it a fascinating study for the family researcher or historian. Prepared by Beers, Comstock & Cline out of their office at 36 Vesey Street, New York City, for inclusion in the first published atlas of Long Island, the 1873 issue of Atlas of Long Island, New York. New York Public Library, Map Division, 1527347.